57. How to create a Facebook Fan Page? In today's Growing Internet world Social Media has become one of the best platforms to promote your business. Creating a Facebook fan page for your business, NGO or Music band is one of the most amazing ways to promote it. Login to your Facebook account by typing in your User id & password, or if don't have one you'll have to sign up for a new one. b)	See for "Step 1: Build Your Facebook Page" on the Centre screen and click on "create Page".
? Business or Place: Once you click this option you need to select your business category or place and type in your business address.
? Company, Organisation or institution: Once you click this option ,you’ll have to select the category of your company, organisation or Institution and type in the name of company.
? 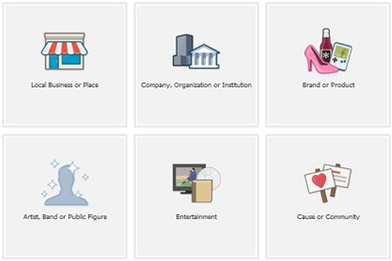 Brand or Product: Once you click this option you need to select the product category and type its name.
? Cause or community name: Once you click this option, you'll have to type in the name of the community or the cause to be promoted. The user has to click “Agree with Facebook Term & Conditions after selecting the appropriate category. Once you are done with selecting the categories click on "Get started"
a)	In the "About" tab you need to fill in some basic details like Description and type in your website name. b)	In "Profile picture" tab you need to select a profile picture which will be displayed against the Page name. 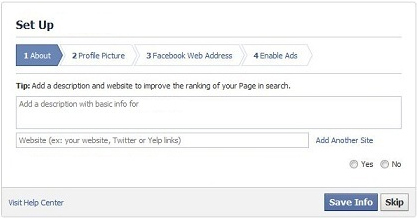 c)	In "Facebook web address" tab you need to enter your unique page name which makes it easier for other users to find it. 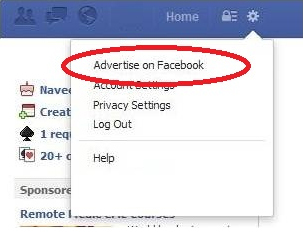 You can click on enable ads or skip to move on and Voila your face book page is created.